Each week Our Heavenly Father has had me focus on one particular aspect in our Bible study. Yesterday at 6 AM HE awakened me with this word “Faithful and True”. I was groggy and fell back asleep. At 7 AM I was awaken again with “Faithful and True”. This time I got out of bed and went to study this out. Sure enough, HE wanted me to focus on the Second Return of Jesus Christ found in Revelations 19 to 21. I believe this to be noteworthy. This Bible study is moving us toward an understanding of the preparation of the Bride that demands the attention of the saints. Is it coincidental that this Word has come at this time? I think not. After just completing seven years the month of focusing on the revelation of Love, this Word comes. As Kemper said in yesterday’s Bible study, “You have to see it in order to be it”. First, revelation must come in order for you to lay down your existing belief or doctrine for the manifestation of the revelation to come to pass. 3 Peter (revelation) therefore went out, and the other disciple (John,Love), and were going to the tomb. 4 So they both ran together, and the other disciple (Love) outran Peter and came to the tomb first. 5 And he, stooping down and looking in, saw the linen cloths lying there;yet he (Love) did not go in. 7 and the handkerchief that had been around His head, not lying with the linen cloths, but folded together in a place by itself. 8 Then the other disciple (Love), who came to the tomb first, went in also; and he saw and believed. Do you know Our Heavenly Father? What a simple question but what an all encompassing one. If you don’t love other people, you must question how well you know Our Heavenly Father. Do you look for opportunities to bless others or do you look the other way? Are you a good listener or are you so busy making your point, you fail to listen to what the other person is saying? What was your emphasis this holiday season? To give, or to get? The end of the year is upon us, did you financially assist anyone this year or did you judge everyone around you to be unworthy of your support? Did you spread some kindness to others? Did you sacrifice time or other resources without any expectation of return? Did you ask forgiveness for doing harm to someone this year? These are tough questions for all of us. Each of us must do a personal assessment of our growth. We must put away the childish things and deal with more mature matters. If we are to be as HE is, our fruit should pass inspection. One of the goals of our Bible study is to pursue the fullness of Our Heavenly Father’s character. As you better understand HIS character, you will begin to understand that every word given to us in Scripture has Love as its core intent. This will open the door to greater revelation in the coming year. May 2013 produce a fruitful harvest! Our Bible study broadcasts are at: http://www.ustream.tv/channel/the-baptism-of-love We welcome your participation. The price began the year at $28.78 and is ending the year around $30.00, a 4.2% increase. It had a $10 swing during the year. That is volatility. We began the year at $1,598 and gold closed at $1,657, a 3.7% increase. The low was $1,540 and the high was $1,791, a $251 swing. Both metals performed about how I expected. Summertime is typically down for metals as it was this year. Documented manipulation kept both metals at the lower end of my expectation, especially gold. In 2013, I expect gold to break the $2,000 price level and silver should break $40. Right now my focus is on the gold and silver mining shares. I believe they are 20% underpriced versus the metal. I believe that accumulation of the physical metal is insurance. Your safe deposit box may be heavy but it did better than bank Certificates of Deposit this year. I don’t provide recommendations for other people’s investments, I simply share what I am doing for my family. I bought silver in the $28 range this year as well as the $32 range. It matters not to me about the volatility since I believe the price is in an upward trend. Obviously I would love to buy at the low. I simply buy a little as I get some extra cash. If the price seems a little high, I wait until it moves back down. If the currency wars really heat up, the sky is the limit on precious metal prices. It we have another financial system meltdown, people will flee to the safety of gold & silver. If the various governments around the globe curb spending, become fiscally responsible and begin in earnest to pay off fiscal debt, the metals could suffer. I don’t think that will happen. My conclusion is that gold and silver will continue their upward trek. Gold’s channel will move between $1,600 and $2,200. Silver appears to have built a $28 base and could see $45-50 this coming year. A black swan event could bust the highs overnight. DISCLAIMER: Visitor understands that the Websites may contain information about various types of investments, investment strategies, or investment philosophies, but that this information and Content does not constitute "advice" related to Visitor’s personal financial situation, nor does it constitute any "recommendation" on how to invest Visitor’s portfolio of assets. No investment strategy, investment philosophy, or investment discussed or presented on the Websites is "suitable" for any specific person or situation. None of the information on the Websites constitutes a solicitation to buy or sell any security or investment. Visitor understands that opinions regarding investments, investment strategies, or investment philosophies presented or discussed on the site may differ from each other or vary widely. The investments, investment strategies, and investment philosophies discussed or presented on the Websites each involve their own unique risk factors or considerations; these risk factors are not discussed on the Websites. Visitors should consult with a licensed, qualified investment professional, and/or research the risks involved, before investing: THE COMPANY ACCEPTS NO LIABILITY OR RESPONSIBILITY WHATSOEVER FOR ANY LOSS OR DAMAGE OF ANY KIND ARISING OUT OF THE USE OF ANY OF THE MATERIAL ON THE WEBSITES, OR AS A RESULT OF MARKET RISKS. INVEST AT YOUR OWN RISK. Many Americans have never traveled overseas thus they are unaware that other countries pay close attention to the news coming out of the U.S. Since we are the largest economy in the world, our actions or inaction causes ripples in other countries. The current fiscal cliff impasse is pathetic. Politicians have known for years that this day would come. Addiction to power has caused them to become blind to the real reason they are there- to serve the people. Instead they walk the halls as though they have been “anointed” kings. Our Heavenly Father DOES select men and women to carry out judgment on the land. HE does use vessels of dishonor to carry out HIS plan when lawlessness prevails in the hearts of men. This is not a time of blessing. The U.S. Treasury Secretary came out on 12/26 saying that he could do some maneuvering to postpone the shutdown for up to a couple of months. Why is this just now being divulged? The politicians do not really care if the average worker lives in fear and uncertainty about their upcoming budget crunch. Congressman have a sweet retirement and healthcare plan that is much better than all but a few of their constituents. The damage done to global confidence in the U.S. dollar from collapsed negotiations may be severe and largely irreversible. Normally gold is a good barometer but it has been heavily manipulated recently, more so than usual. As an alternative, the price of oil appears to be a good short-term barometer. Federal Reserve actions to avoid systemic collapse in 2008 and to boost economic growth merely did nothing more than assist politicians in kicking the proverbial can a bit further down the road. Expanded quantitative easing by the Fed in an effort to keep the system liquid has failed to produce a sustainable outcome. The systemic-liquidity crisis continues and appears to be intensifying anew, and it is likely to come to a head in 2013. The day that the bond market has an epiphany about the sad state of the U.S. fiscal balance sheet, the dung will hit the fan. Interest rates will ratchet up and the dollar will slide. The price of gold and silver will open up with extreme gains and oil will look at new highs in terms of the U.S. Dollar. To make things worse, Japan (3rd largest economy) will be inflating its currency. All this is destined to occur unless Our Heavenly Father intervenes and changes the course of the path we are all on. If this is the transition to Kingdom economics, bring it on. Throughout Scripture, transitions never occur without pain. There are 13 global famines mentioned in Scripture. Times were tough. Noah understood the term “transition”. However, Our Heavenly Father is in control and those of us who believe that HE will ultimately fulfill HIS plan will continue to seek HIS Face and be a part of the solution to the huge mess mankind has once again created. Prepare yourself. Incompetence is the lack of physical or intellectual ability or qualifications. The U.S. continues to pursue increased complexity in all aspects of its various systems. Banks are thought to be too big to fail, Government follows a path of unlimited borrowing and unsupportable financial commitments, and students borrow money for fields of study that are in no way economically justified. The ego’s standard modus operandi is to create a problem to be fixed. How many of us use more than 20% or our smart phone’s capability? How many electronic gadgets are now collecting dust on our shelves? We marvel at our children’s toy boxes full of under-utilized toys yet we continue to create complex solutions that are suppose to make our lives better. What new feature do we need in our automobiles? It is increasingly difficult for auto makers to find the next big thing. Hey, stick your foot under the tailgate to open it! I wonder how much that will cost to fix when it breaks? In growing up, many teenage boys learned to work on their car, by necessity. I could replace a starter in twenty minutes. Now, there is no way I would tackle the job. Fuel pumps now located in the tank??? Engineering is now been compromised by the financial manipulators. The goal is to extract wealth from the unsuspecting public. The cost to replace a Lexus starter is much more than a Toyota starter even though they are probably the exact same part. It is all about perception. Financial engineering has now become an art form, anything goes. Regulation occurs with a “wink” at the highest levels for the so-called greater good. How much longer will this path to collapse be sustained? Only Our Heavenly Father knows for sure. Until then we must step back and assess our personal path. We can be assured that another bubble will burst. What day will that happen? Probably on a day least expected by most people. After the fact there will be many to claim that they predicted the collapse. If you throw out enough predictions, you are bound to get one right. Specific prophecies and predictions require specific performance. Until Our Heavenly Father gives you a specific word about the future, you should live your life based on HIS written Word and your specific calling. How many contemporary prophets have prophesied specific words that have not come to pass? Often these words will cause many people to place such weight on the prophecies they will cease any fruitful works. The Mayan Calendar end date was one such prophecy. The prophetic landscape has become so complex that on any given day, prophetic events could be deemed to occur. The predictions I write about are based on what I see going forward based on my calling. Unless Our Heavenly Father gives me a specific, unsolicited Word, I prefer to keep my comments generalized. In the meantime our guide should be confirmed by HIS Word in Scripture. We are all to be fruit inspectors. “End time” prophecy teachers on TV have been issuing the same predictions over and over. If their word does not come to pass, shouldn’t we focus on what we are called to do rather than the distractions all around us? In my forty plus years of exposure and experience in the Information Technology arena, I can attest that higher complexity produces ultimate collapse. Modular programming is simpler and maintainable. One huge program with many functions may work but will not stand the test of time. The same is true for other systems around us. My recommendation is to continue to simplify your life in this world of ever increasing complexity. In the end, the complexity will make us all incompetent. 2012 will mark the end of an era. Japan, the world’s 3rd largest economy, will drive the Yen down and force inflation. As the Yen declines, Japanese bond rates will rise. They are now set for hyper-inflation. The fiscal cliff in the U.S. is akin to rearranging the deck chairs on the Titanic. The true fiscal cliff of $70 Trillion +- is much greater than the $1.2 Trillion that the politicians are debating about on the Sunday news magazines. Japanese Funds are starting to put money into gold as an inflation hedge. The physical gold market shows much greater strength than the paper market. as does the silver market. The golden era of retirement funds reliability is over. The Federal Reserve “experiment” is just about over and we will look back and exclaim “What were they thinking?” I expect notable pain as the new era begins. It will be up to those who have been prepared for these times to step up into their callings and serve mankind. I expect nations to repent of their corporate sin and look to those who have been anointed by Our Heavenly Father to turn them back toward Holiness, just laws, and service to their populace. The hidden sins of leaders will be exposed and cause a major shift in the liberal and immoral attitudes allowed by the silent majority. The death and destruction of the current system will be a pruning with extreme prejudice. We must remove the dead in order for life to spring forth. The dead weight must be pruned away in order to restore health to mankind. For thousands of years gold has been a fundamental store of value and medium of exchange, based on equal weights and measures. Once technology allowed for easy accounting and flow of transactions, the Laws were changed, and regulators opted not to enforce the spirit of the Law, the global financial bubble inflated to epic proportion. Note that gold is the green triangle at the bottom. 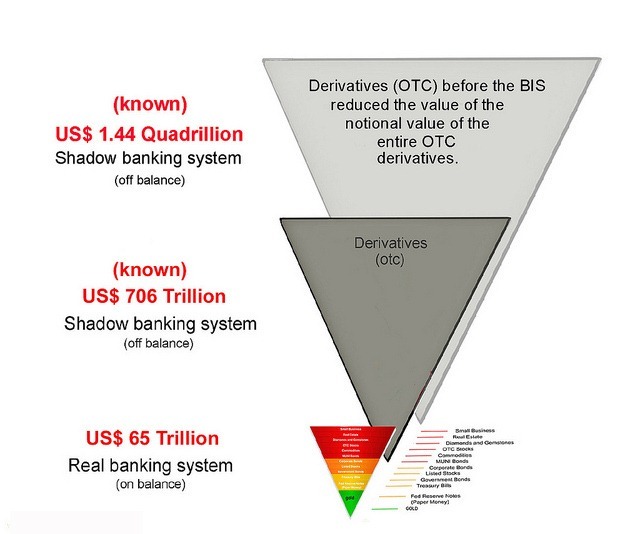 If you took all of the “Real Banking System” money, you could not pay off the true financial obligations of the U.S. I wonder if this is why China keeps building up its gold reserves? Luke 2:14 "Glory to God in the highest, And on earth peace among men with whom He is pleased." The angel and Heavenly hosts proclaimed the arrival of our Savior. Our Elder Brother was manifested in the flesh to become our example and our open door to Our Heavenly Father. His Ministry of 3 1/2 years impacted the world like no other. He confirmed His Word with signs following. His blood was the sacrifice, perfect and innocent. Peace finally arrived on earth. How is the peace spread among men? By division? By quarreling over doctrine? No, by unity. What is the one unifying force among men? Love. The Apostles were willing to sacrifice themselves for the whole world. Are you? The Faith Movement in the Pentecostal Age did not unify mankind. Thousands upon thousand of prophecies did not serve to unify mankind. Love, kindness, peace, and joy are the unifying attributes that will bring men together. No longer being moved by men’s selfish ambitions will bring us to a fullness of the revelation of Love sent from Heaven 2,000 years ago. Love is the missing ingredient required to bring peace on earth. It was spoken by the angel 2,000 years ago thus the seed was planted. Jesus said that Israel would not bring forth the fruit at this time. We are called to manifest as Sons of GOD and bring forth the fullness of Love to the earth. I expect 2013 to bring forth confirming signs of fruit. You are currently browsing the Servias Ministries Blog blog archives for December, 2012.